value (V) (ie lightness), brightness, intensity. 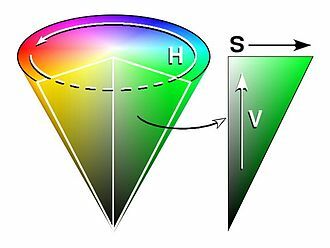 The HS* color spaces are simple geometric transformations of the RGB cube into cylindrical form. The variables are assigned to cylindrical coordinates in an attempt to be more intuitive and perceptually relevant than the RGB cartesian (cube) representation. and the distance along the axis corresponds to “lightness (value)” or “brightness”.